On Action Point, at the Summit Bechtel Reserve, there stands a bronze statue of young Stephen G. Marriott (1957-2013) in his Scout uniform. Stephen was a business leader, Distinguished Eagle Scout, and advocate for people with disabilities. 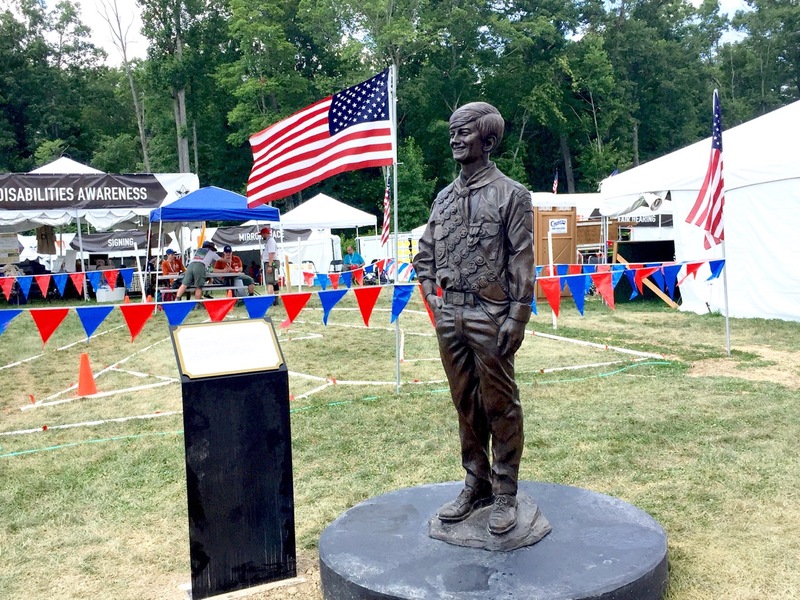 His statue overlooks the site of the Disabilities Awareness Challenge during the 2013 and 2017 National Scout Jamborees. In the future the site will contain a permanent facility dedicated to disabilities awareness. The forthcoming center will give Scouts the opportunity to experience some of the disabilities that people with physical challenges must live with every day. Scouts will take training and complete exercises to help them get a feel for what it would be like to have these kinds of challenges. The dAC Staff Newsletter is written for staffers in the disAbilities Awareness Challenge at the 2017 Jamboree. If you are curious about what we’ll be doing, feel free to take a look. It’s not too late to join our staff!